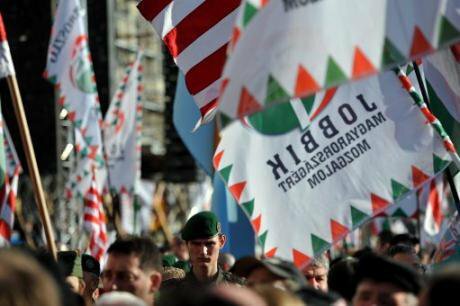 Jobbik rally in Budapest. Tamas Kovacs/Press Association Images. All rights reserved. Paul Mason recently offered his thoughts on Brexit, lamenting the difficulty of being part of a European community that also includes millions of “closet Nazis”. He was referring mostly to the inhabitants of post-communist countries. According to him, eastern Europeans are politically immature – they support the far right and are being used to break up the EU, just like the peasants whose support helped Louis Napoleon fracture the French Republic in the nineteenth century. But even though berating eastern Europeans can at times be understandable, the key problem is elsewhere. The main threat to Europe today is not the former east, but the far right in the West. The post-communist world is, first of all, a warning memento. A practical example of what it looks like when ultra-conservatives, radical Euro-sceptics and xenophobes assume power. Do the British really want this? For a long time, not many people had really been interested in central and eastern Europe. If the media in the west devoted any ink to us, it was mostly in connection with communism, with heroic figures like Václav Havel or Lech Wałęsa, and, in the case of the British tabloids, portraying us mainly as countries full of violent savages. But what did we, the inhabitants of the so-called post-communist countries, become to the west? Often a source of cheap labour as well as pupils meant to be learning about liberal democracy. But it was forgotten that both these things are in direct opposition. The post-communist countries played the part of cheap factories and simultaneously induced disappointment by "lagging behind the west" and not being liberal and democratic enough. But only few asked themselves whether it is possible to make a cheap assembly line into a mature democracy. But who really belongs to the middle class here? It is usually expected that the middle classes will own decent housing, won’t experience urgent financial difficulties, will have secure work, free time, a solid pension and no problems raising and supporting their children. But if we take into account the low wages in east-central Europe, the idea that most of us conform to these criteria is absurd. Of course one can object: it’s our own fault. We manage our countries poorly and should demand that rules be enforced better. But at the same time, we do not live in a vacuum. The inequalities between the core of old Europe and the post-communist states are of a systemic nature – cheap labour from the east, it turns out, is profitable for western corporations. It is a fair and common criticism of east-central Europe that it refuses any solidarity with refugees. But can we really just put it down to the fact that the eastern Europeans are just the immature “peasants” Mason writes about, or “simpletons freeloading off the west”, a common belief among the voters of UKIP, AfD or Front National? First and foremost, we must realize east-eentral European countries are not the prime forces in Europe’s worsening climate, though they certainly play a part. Who is really driving the ship down is apparent also from the number of confused Eastern Europeans who paradoxically cheer the Western far right on, even if they are a matter of scorn for the latter. It’s nothing new. Hungary’s despicable current leader, Viktor Orbán, was an old admirer of Margaret Thatcher. And even Polish PiS supporters, more reserved in their attitude towards the Iron Lady’s legacy, see their leader, Jaroslaw Kaczynski, as a follower of the “great traditions” of Ronald Reagan, Charles de Gaulle and Margaret Thatcher. The British conservatives were equally admired by Václav Klaus, ex-president and prime minister of the Czech Republic, today more known for his rabid defence of Nigel Farage, the German AfD and everyone who wishes to replace “Brussels socialism” with a sharper, right-wing cure. Brexit might remove these clowns to the sidelines. But it could also mean a victory for those who set the tune of this entire false melody, like Marine Le Pen, UKIP and others. Only they – with the eventual support from Russia – can finish the work of destruction. East-central European countries do not have the economic power nor the international influence to do that – more than anything, they are an image of the fanatical introduction of neoliberalism; they show what happens when the far right becomes hegemonic. It is not yet a matter of open fascists or an attempt to catch up with them. But the examples of Orbán’s Hungary and Kaczynski’s Poland unfortunately show that this type of politics is functional. Citizens who believe they should ask nothing from the state and concentrate their frustration on minorities and migrants are ideal for politicians who don’t have to care for people’s well-being, but can focus on their personal interests. If people today, then, are considering leaving the EU, it is the post-communist world that should warn them against it. If someone wants the governance of eurosceptic right-wingers, let them look to the east for “inspiration”. That is, to the countries which have had almost thirty years of coarse-grained capitalism, extreme austerity politics, and an ideology of collective selfishness. To countries in which public space is flooded with racism, where the elites feel as though they can do anything, and where institutions often behave in a predatory manner. One result is that people in the Czech Republic succumb to conspiracy theories spread by demagogues, such as refugees being an “organised invasion” of Jihadis, plotted by the political elites in the US, EU and Arab countries. That is a truly strange situation, when citizens think politicians are just a group of murderous maniacs who plot with terrorists to kill us. And why do they think that? It bears witness to their absolute lack of faith in democracy, the enforceability of law and a functional state. Yes, western Europe faces similar trends. And Brussels is definitely not a major guarantor for the situation not to deteriorate like it did in post-communist countries. But Brexit is not a solution in the globalised world. It is only another check-point on the road to catastrophe. It’s difficult to imagine Britain operating at the edge of a broken Europe, protecting its citizens against tax evasions, low wages and the turbulences of the global economy. The channel, which can be overcome with a train or a low-cost flight, is a much smaller obstacle today than it was in the time of Louis Napoleon, brought to power by the conservative peasants. European institutions cannot even be changed by an abandoned Greece, chased into the corner. But it can be done by self-conscious Britain, standing in the coalition of those who refuse the stifling politics of austerity and Thatcherite models ruining the economy. Our true hope is the victory of a democratic, free and, most importantly, solidary Europe, whose citizens do not resign on the matters that concern them, but strive for them all the more.